At MC Property Maintenance we offer a complete range of high-level cleaning, painting and decorating services. Based near Bognor Regis, our established team of contractors works with private and commercial clients across the whole of the South East, including Sussex, Hampshire, Surrey and London. 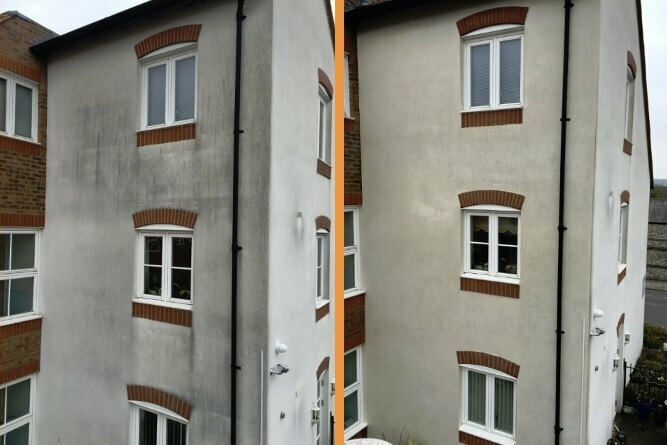 We routinely carry out skilled high-level work, including exterior cleaning, painting, repairs and storm damage. Our professional painting and decorating team pride themselves on the quality of their work and the value for money that we deliver. We provide specialist DOFF cleaning services, using high-temperature steam to remove stains, moss, graffiti, paint and pollution from a wide variety of building materials and surfaces. This low-pressure method is ideal for fragile masonry and stone and the low volume of water prevents deep saturation issues. Gutters aren’t often recognised for the vital part they play in a property’s drainage until they become clogged. Poorly-maintained gutters can attract pests, lead to water stains on the exterior of the building and even cause interior and exterior water damage. 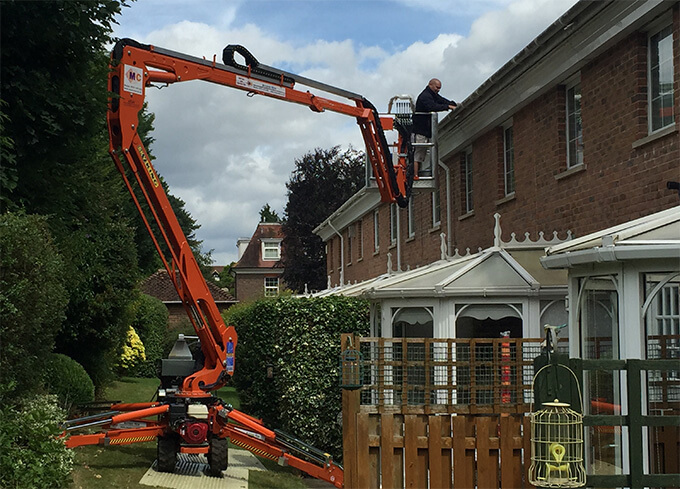 Twice-yearly gutter cleans are recommended, which our team can carry out using high-reach tools and platforms. MC Property Maintenance can provide a range of bird prevention systems for buildings across the South East. Plastic or steel spikes are an inexpensive way of deterring birds from landing on a ledge and can be tailored to suit specific problem birds and particular ledge types. For more information, go to our bird prevention page. Our high-access equipment allows us to assist professional surveyors in carrying out roof surveys and inspections. If you are concerned about damage to your roof or chimney, having a professional opinion can help you to determine the extent of the damage and estimate the cost and urgency of repair. Why choose MC Property Maintenance? We understand how important it is to maintain the external appearance of your property, whether it’s your private home or commercial enterprise. 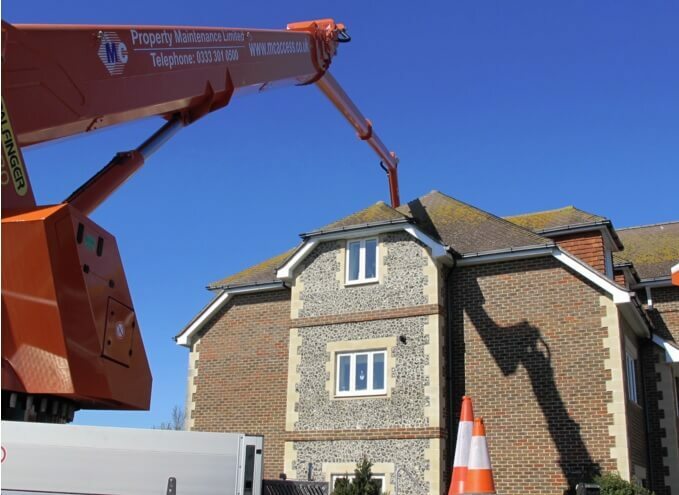 Our wide range of cherry pickers can make this work safe, simple and easy to carry out whatever your circumstances, and all of our painters and decorators are fully qualified and comply with all relevant health and safety regulations. Our experienced team plans, organises and manages projects from end-to-end, whether you require assistance with home decorating or a large-scale commercial clean. We are dedicated to providing the best possible service and save our clients money by using high-quality, competitively priced materials and getting any painting, cleaning or maintenance job finished efficiently. 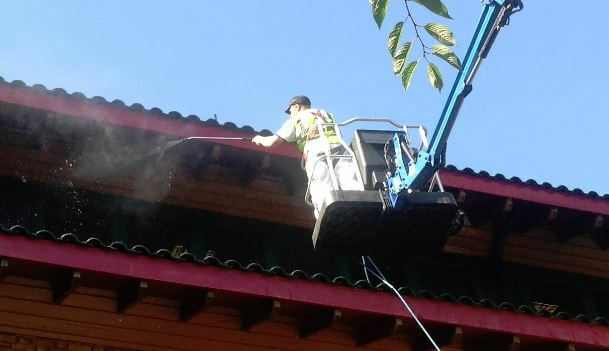 Find out more about our high level gutter cleaning and maintenance services. Call us now on 01243 530 076 for a quote.